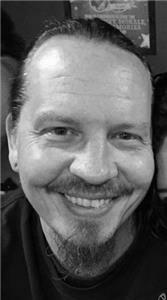 Brian Patrick Murphy, 46, died at his home in Chattanooga, Tennessee, on Friday, August 3, 2018. He was an artist and a tinkerer who loved motorcycles and music; he saw the truths in the world. Brian’s humor, brilliance, and compassion for others inspired us all to live better. He is survived by his wife, Shannon Murphy; siblings Major Murphy, Mark Murphy, Mary Murphy, Karen Martin Taylor, and Jeff Martin; stepmom Jean Murphy; and Aunt Sissy. He was predeceased by his father, David Murphy; mother, Sandra Martin; and brother, Lex Murphy. Services will be held at 11:30 a.m. on Saturday, Aug. 11, at Tennessee Riverpark, Shelter #1 (4800 Powerhouse Road). Arrangements are by Cremation Center of Chattanooga, 1345 Hickory Valley Road, 423 362-5999.